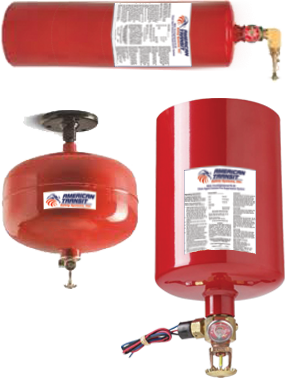 ATSSI’s CF Thermatic Automatic Extinguisher Systems are a unique line of patented, dual-agent and single-agent overhead fire extinguishers that provide fast fire suppression with no water damage. Proprietary CFF technology combines the extinguishing power of two highly effective and proven agents for faster suppression and greater coverage - in other words, more protection for your money. In fact, at a fraction of the price of piped systems, a CFF system is appropriate for all applications where water just isn’t an option.